Google’s I/O Developer conference 2017 brought about the announcements of Google Assistant on iPhone, new Android O features and the launch of Android Go. Android Go is a whole new version of Google’s operating system designed specifically for those with low-end devices that don’t pack much RAM or processing power. It’s a lighter version of the Android OS and makes the system more optimized for devices with lower performing specs. It’s designed specifically for phones with between 512MB to 1GB of RAM, which are now few and far between but still exist. Devices such as the new Moto C or the rumored Huawei Y3 will likely be able to run Android Go, as each has limited RAM onboard. How will Android Go work? Android Go takes the features of Android O, and tries to make these work as best they can on a lower-end device. As well as optimization, the new software will focus on rebuilding Google’s core apps - such as Gmail and Google Chrome - to ensure they use less storage space, processing power and mobile data. 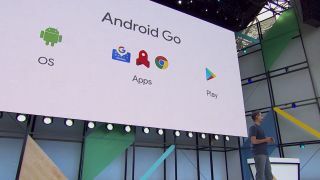 Android Go will also highlight apps that use less data, storage and memory on the top of the Google Play Store. A section that says “optimized for your device” will show you lighter versions of the apps you love, such as Skype and Facebook. This helps you use less data to download and use apps, and Android Go also shows you how much data you've used, so you can keep a close eye on your remaining allowance. That means if you have a more limited internet package you can make it go further with Android Go and the light apps it highlights. Other services are launching alongside Android Go, including YouTube Go, which will allow you to watch YouTube videos offline (a feature previously reserved for YouTube Red subscribers), meaning you can download them using Wi-Fi and won't be using as much data while you're out and about. When will Android Go launch? Android Go will launch at the same time as Android O officially lands on devices, which will likely be October. The first devices toting Android Go won't land until 2018, but if a lower-end device gets updated to Android O before then it could also benefit from Android Go. Why is Google launching Android Go? Google wants as many people as possible to have access to the Android platform and services. Google currently has over two billion active Android users and it wants to expand that to another billion by focusing on those who can't afford high-end devices and making the low-end Android experience that bit better. If you own a top-of-the-range Android device you won't ever be using Android Go's features, but for those who can't afford dazzling phones it makes a lot of sense to bring the highlights of Android O to those on tighter budgets. MediaTek has confirmed that it is chipset partner for Android Go, with its MT6739, MT6737, and MT6580 SoCs (system on chips) now offering support for Google's paired down operating system. It has also confirmed that Android Go devices with its chipsets will ship from Q1 2018.